Mobile shedworking is becoming ever more popular with all kinds of gadgets to help you work while you're on the move: also on the up are temporary shedlike atmospheres and while the one-person pop-up SukkahSeat by Charles and Julian Boxenbaum of BUZstudios is not specifically designed for working on the move (actually it's for the intermediate days of Sukkot), it could easily be adapted for just that purpose. It has a spring-loaded frame, seat and fold down armtable. It all fits nicely into a special carrying case, The SukkahSack. For those familiar with your talmudic units of measure, the SukkahSeat is 9 x 9 tefachim and and approximately 18 tefachim in height. 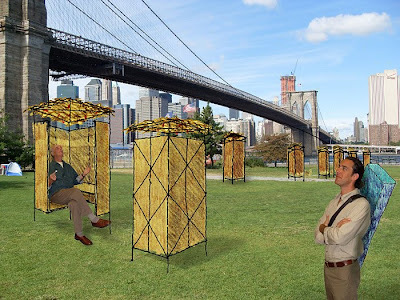 If you're after a prefab portable Sukkah, pop along to the Sukkah Centre which has a remakable range including bamboo and fibreglass.